The picture below shows a rest point for passengers. 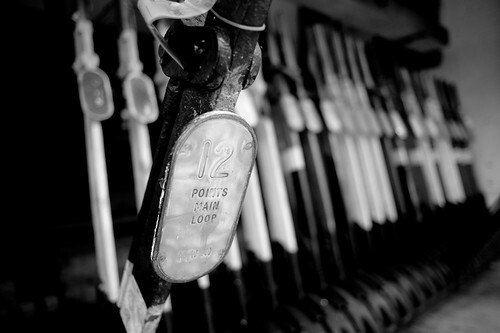 It is important to note though, that in recent times, the station had become a loop station – meaning there was actually no boarding or alighting of passengers at the station itself. 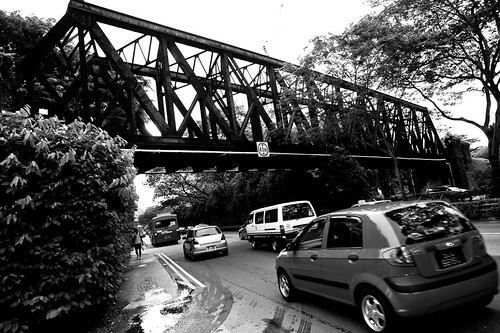 The station can be accessed most conveniently from the base of the iconic black Truss Bridge running across Upper Bukit Timah Road. This is a familiar site in this area, and is very near the MacDonalds at King Albert Park. In fact, it was from this bridge where 2 footpaths can be found flanking the bridge which will lead one to the station. 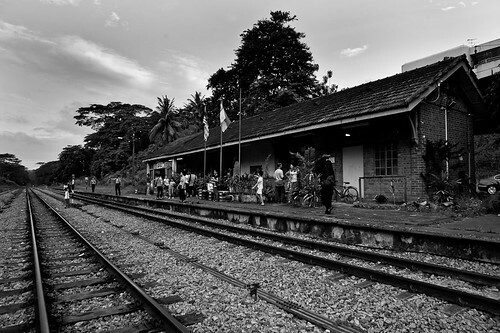 It’s sad that we didn’t treasure what we had until it’s gone (poignant words from one of the KTM workers) and this station in its last days had seen a great number of visitors flocking to see and photograph it before it became a distant memory. 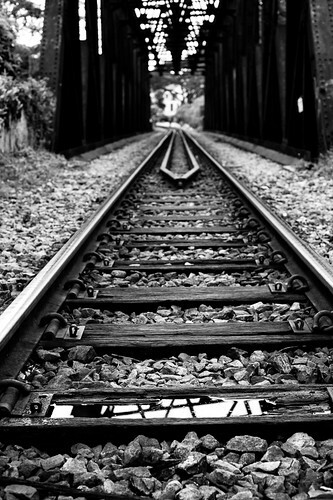 Everything about this place has a very early 1980s feel to it – the design of the tracks and the materials that were worn out over many years bear witness to the long 79 year old history of the KTM railway in Singapore. 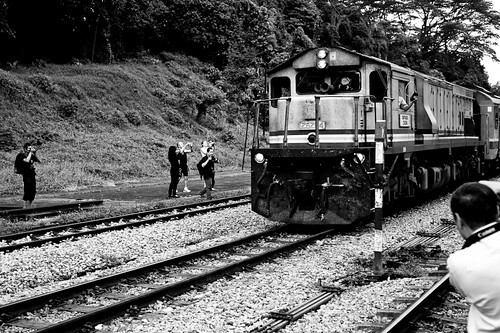 In 1932, the first train left the Chua Chu Kang railway station (today it’s a signal hut at the Chua Chu Kang level crossing) and rolled towards Tanjong Pagar station for the first time. 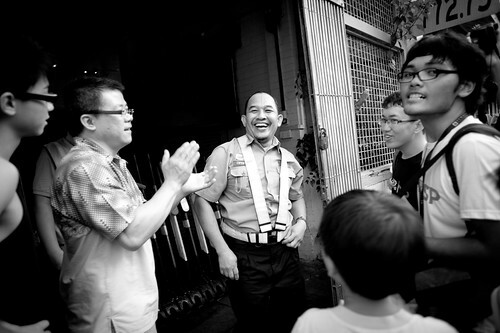 Mr Atan (far right) and friends. The man in the centre is Mr Hashim, who is the “last station master” as he is re-assigned to the new Woodlands station, thus continuing his relationship with Singapore. 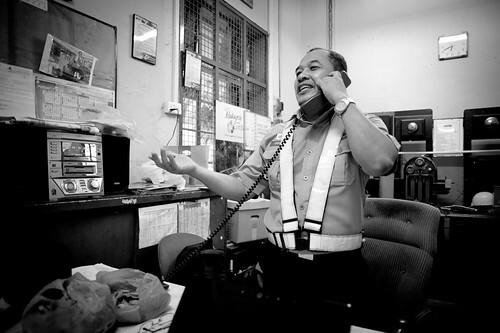 It was not hard to like Mr Atan – besides allowing us a peek into his daily work life, he also took the time to talk to, and answer the many queries we have regarding train operations. 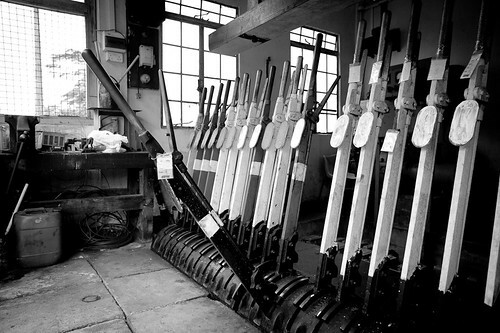 The KTM railway in Singapore was one of the last bastions of the practice of token exchange, an antiquated system inherited from the colonial British era where tokens were exchanged between the station masters and train drivers. 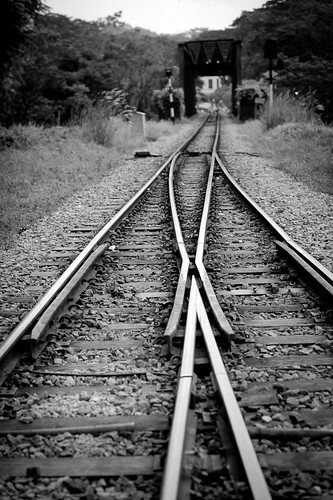 Since the track is two way, the holder of the token will have the right of way. 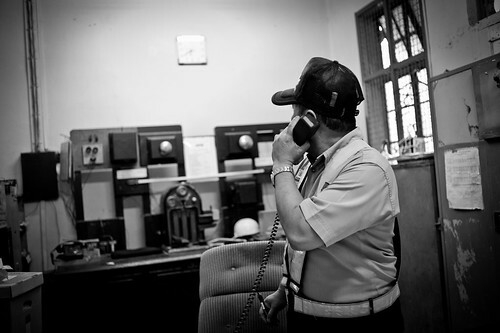 This old system is no longer in use along other parts of the KTM railway in Malaysia, having been replaced by newer electronic systems, but it is still practiced here in Singapore, and as Mr Atan put it “it’s old but it’s a reliable method”. Once again, it’s hard not to like an always smiling guy! 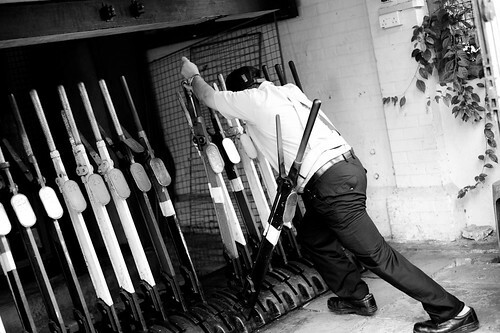 I was so fascinated by this practice that I hung around for the next train to photograph it from a different angle. Today, this practice is no more. 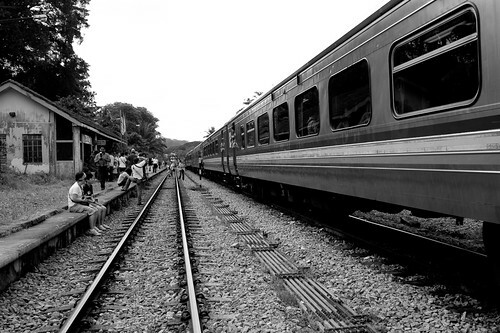 Token exchange – this train did not stop after receiving the token from Mr Atan. The big loop made it easy for the receiving train worker! A close up view of the token. 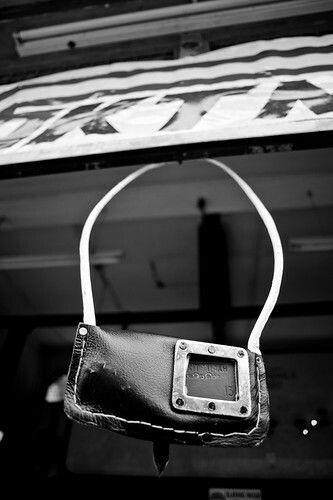 The pouch is used to hold token keys. 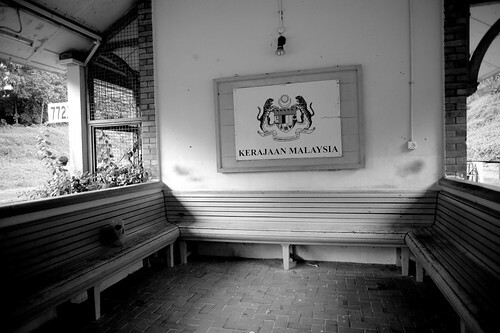 After that it was time to file in the paperwork and to place a call to the main station in Malaysia. Finally he was able to take off his hat and engaged in a little banter with his colleagues. Mr Atan also kindly showed us the system of levers he had to manipulate before a train would arrive at the station. Those levers were heavy; it’s not as easy as it looks! 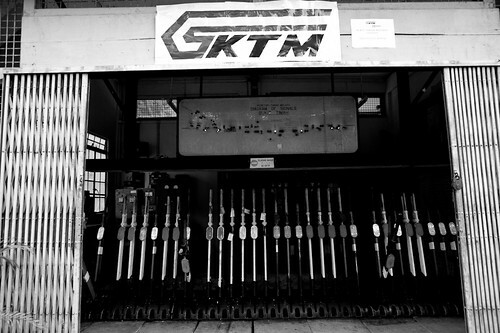 KTM levers used to manipulate the tracks at Bukit Timah station. 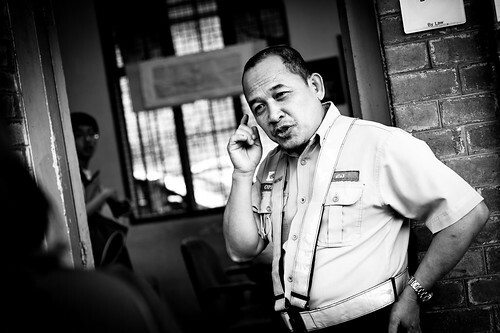 According to Mr Atan, in Malaysia some stations have modernised systems that are not so manual. Mr Atan showed us that by pulling and pushing a system of levers, he was able to manipulate the hydraulic mechanisms of the tracks, altering the train course via alignment of the tracks. After the explanation, Mr Atan got a health dose of appreciation from the crowd by the way of hearty applause. The levers are the secret to muscle building according to him – no need for the gym!!! 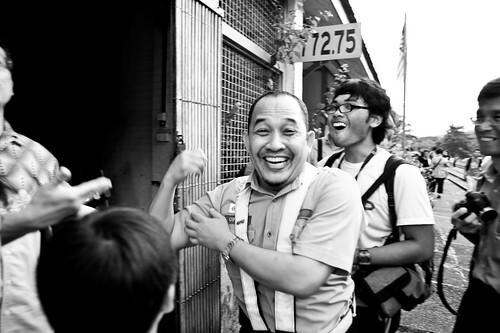 Mr Atan showing off his muscles! The KTM railway may be no more, but hopefully our little bit of history will be preserved in the form of these photos and accounts. It is truly sad that this station saw its most number of visitors only in recent times, under such circumstances. None of the KTM staff probably thought they would become celebrities, followed by the camera and interviewed by the curious public. 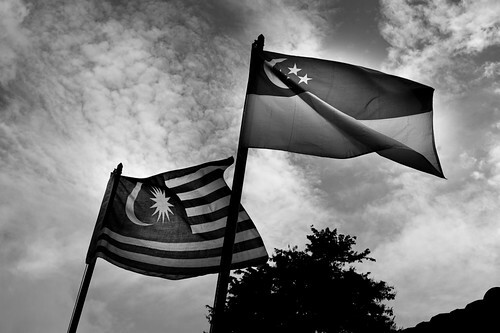 In the end, it was perhaps a most fitting end to their time in Singapore – it was their hour. For their long standing contribution to railway travel between Singapore and Malaysia (Mr Atan and his colleague, Mr Hashim have worked for over 30 years), they are really appreciated. 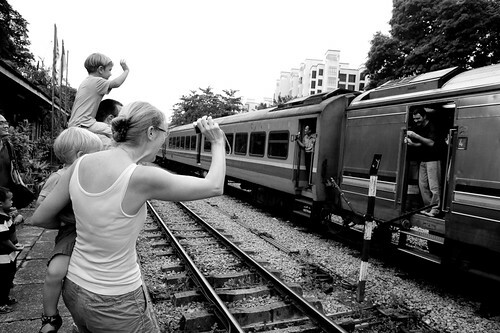 A lady and her family waving goodbye to passengers onboard a departing train at Bukit Timah railway station. 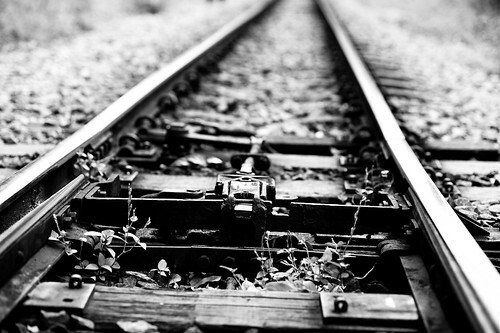 On the night of the 30th July, the last train went past the station and the tracks remained slient ever since. 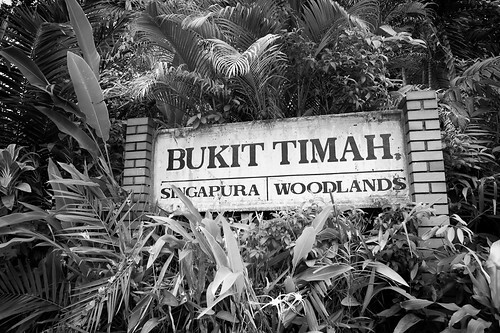 In Part 4 of this 5 part series, I will be talking about more of the Bukit Timah station, as well as the iconic Tanjong Pagar station. Hope you are enjoying this series so far and feel free to leave your comments and feedback! I am a NUS student, and my team is preparing a short video of green corridor. It would be nice if we can include some old photos of the places. May I know if we can have the permission to use some of the photos?